I hope this finds you that you all survived the holidays!! Mine were quiet, to quiet, but nice. Oh wait, you didn't ask how mine were. Well, now you don't have to ask, see how accommodating I am? Kolaches were a special occasion treat. I mean, a REALLY special occasion treat. 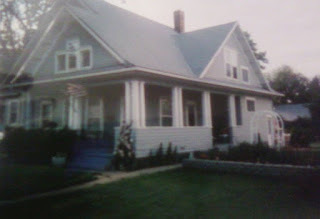 Someone was coming to visit, Christmas, Easter, days like that. And where there were kolaches, there were cinnamon rolls too. And my mom always made a special batch of cinnamon rolls without raisins because I hated them. Don't judge, I was her perfect baby, she would do anything for me, up to AND including making cinnamon rolls with no dead flies in them. I am sure others didn't like them but in my mind, it was all for me, ya know, cause that is how babies of the family think. Ok off my cinnamon roll tangent...random. Anyway I believe these are a Czech/Polish thing. My grand mom was Czech, and I grew up in a hugely Polish area. Every woman in town made these I think! My mom would always let me make the dents in the center. I loved the sound the dough made when you poked it! 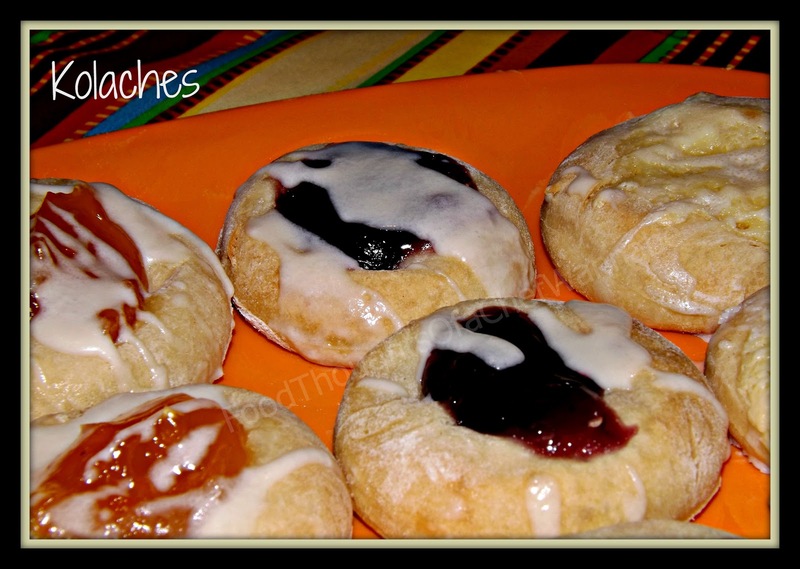 I was never all ga-ga over kolaches because I hate fruit. Oh, and before I get into that, let's get the pronunciation correct before we move on. COAL-AW-CHEE. Get it? This is the way everyone in my town pronounced them, and they had to be right. I have heard everything from "call-achee, coal-achey, coal-awsh" and I could go on and on. The old scary church ladies in my hometown, were right, just ask them, I dare you. Anyway, back to why I wasn't a fan. I don't like fruit. That is all. And my mom would fill them with apricots, cherry, PRUNE, poppy seed, and cottage cheese. She also made this little crumble for the top which I have changed out after 2 solid days of YouTube video's. I also found this very elderly woman's video, which she was making for her great grandchildren, and she made a sweetened cream cheese filling. I knew at this very moment, I had a new found love for the kolache! 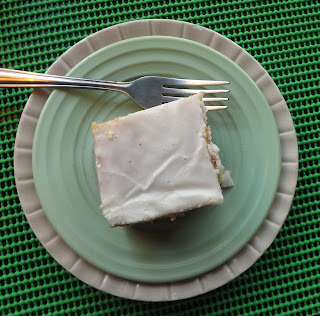 This is a recipe passed on from my mom who says she can't remember the cookbook name, but she has been using it for over 50 years! The cover is gone, the back is gone, half the pages are unreadable, but the kolache recipe remains unscathed! This takes a little time, but is not at ALL difficult! I also will include the recipe I used for sweetened cream cheese. In addition, I used 1 can of apricot pastry filling found with the pie filling. There are all kinds to choose from. I used a regular can of blueberry pie filling as well! This recipe made 49 kolaches. I would make them bigger next time, just because.....! In a bowl (stand mixer bowl if you are using one) add in 1 cup flour, sugar, salt and yeast. Mix with a spoon until combined. Heat milk, water, shortening and mashed potatoes until warm. This doesn't mean until the potatoes and shortening are melted, just warm, You don't want a boiling mixture or you will kill the yeast. Just ask me, I thought I did it! Get it to about 115 degrees. Add it to the bowl with the flour mixture. Mix with an electric mixer or your paddle attachment on your mixer, for 1 minute. Add in eggs and beat about 30 seconds at a low speed and then 3 minutes at a higher speed. Add in remaining dough and mix 3 minutes. Your dough will be soft and sticky! Cover and let rest for 20 minutes. Roll out to 3/8th inch thick, using a 3 inch cookie cutter (or really any size you want 3-4 inches, but you will get fewer kolaches) to cut rounds. Place on a greased or parchment paper lined cookie sheet. Let them rise a second time. Using your first 3 fingers on each hand, make a indent in the middle almost to the bottom. You will fill this with your filling of choice, so make them as little or big as you like, just make sure you have a ledge of roll around the edges. Fill each one with enough to fill your indent (1 to 11/2 tsps depending on size), and bake at 400 degrees for 12-14 minutes. (12 for my size rolls, if you make them bigger 14). Mix with a hand mixer until completely combined and smooth. Use to fill Kolaches! So there they are. Easy, and delicious. If you are a person who is freaked out about killing yeast, just use a clean meat thermometer. If you overheat the mixture, let it sit and cool a couple minutes, it is easy so stop letting it freak you out!! Enjoy these delicious little pastries that will make you go..."Mmmmmm"! It is like a carb addict's dream. This is a once or twice a year treat, I grew up on. This dish will make some of you go...."WHAT is she THINKING"? Seriously, just chill! This is a dish I grew up on here in Nebraska. I have never heard of anyone else eating it. I don't know if it is just a Nebraska thing, a Midwestern thing or what but let me tell ya somethin'...NOTHING tastes better on a freezing cold, snowy day than THIS dish! This is not soup. It is not "pot pie" as my easties would call it. 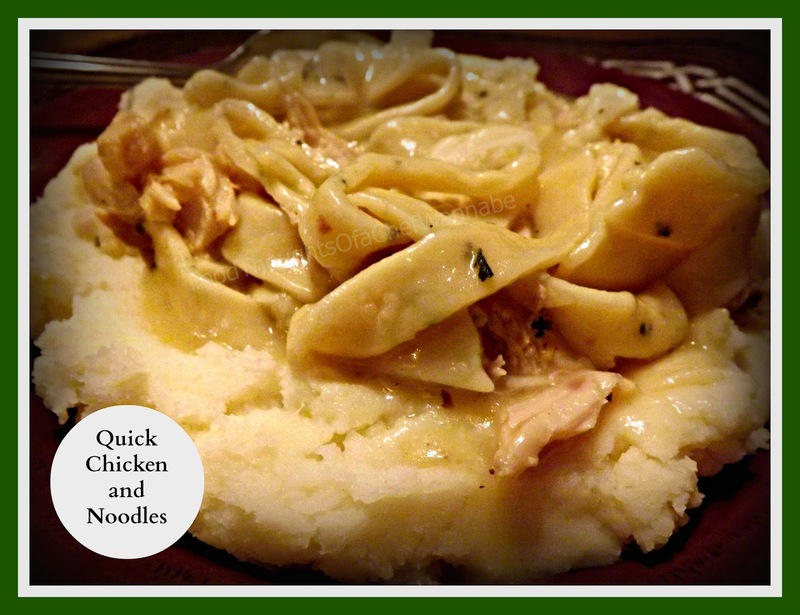 It is "Chicken and Noodles". Thick and creamy and served alone or on a bed of mashed potatoes. When I moved to Jersey, some friends wanted a "Nebraska" kind of meal. I made them this. I make fresh pasta when I make this. It is to easy and delish not too. If you don't groove on making your own pasta, use 2 bags of good thick frozen noodles, or a large bag of egg noodles. Makes no different to most people, makes all the difference to me. You may need a few more noodles than I recommended. 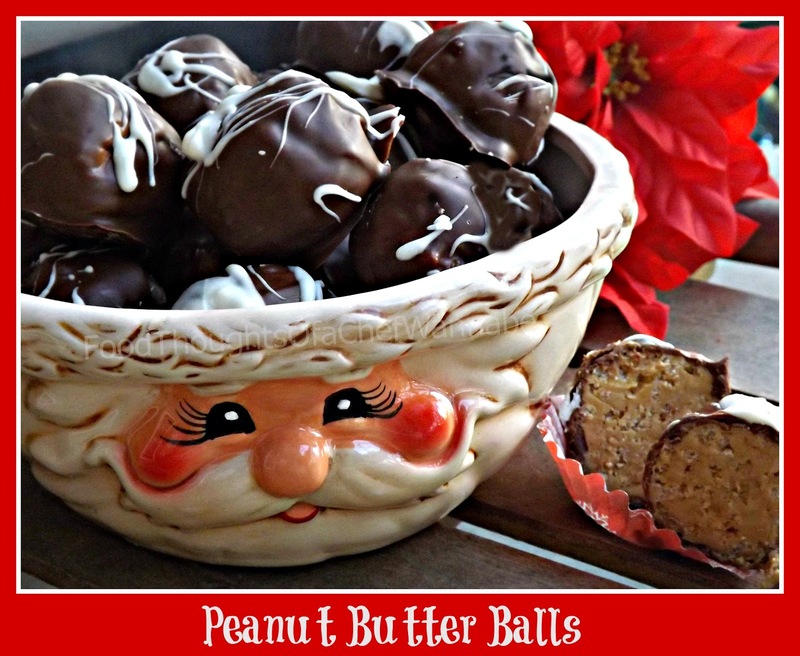 I am not sure how many in pounds or ounces or anything else my recipe makes homemade. So keep a few extras, you want this SUPER thick! This recipe makes a boatload, but again, eat to your hearts desire and FREEZE, because it freezes like a dream. In fact, when you decide to eat the rest of it up, you can always add some extra chicken stock and just have it as Chicken Noodle Soup! This is a QUICK version so I am using store bought items. The point is to get this baby cooking ASAP! This is a quick version, (aside from my homemade noodles) much different than how my mom made it but, better....oh wait. Did I say that out loud? Anyhoodle, you decide on the noodle part. I will give you the recipe I use, it is not the same as my Amish noodles, but those will work too! Mix eggs, flour, salt and parsley together. Add water or chicken stock for more flavor until a nice, non sticky dough is achieved. I use my kitchen aid pasta roller but you can roll it out by hand just as easy. Roll the dough as thin or thick as you like. Roll out 1/4 of the dough at a time. You may need to dust your pieces with some flour if they are a bit sticky. Let the sheets sit, divided by a kitchen towel until ready to use. There is no need to let them dry. Use a pizza cutter to quickly cut them into the width of noodles you like! Mix all ingredients except chicken/turkey. When combined completely add poultry. Bring to a boil and add the noodles a handful at a time until they are all in the pot! After cooking there should be VERY little broth. You want it thick. Ladle over a bed of mashed potatoes and eat your heart out carb lovers! If you don't have a great mashed potato recipe, here is mine Perfect Mashed Potatoes and Gravy! Again I realize this is something we can't all eat everyday but that is what makes it so cozy and comforting, that once or twice a year you DO get to eat it. Memories of childhood winters just play like a movie in my mind. Sledding at Aubles pond, down the hill on to the frozen pond, hiking home, 3 blocks behind the older kids who wouldn't wait for me, snot running out of my nose, bawling, sled and ice skates in tote............perfection. It is with great love, happiness and friendship I write my Christmas letter to you, friends I never would have been blessed enough to meet without the creation of FoodThoughtsOfaChefWannabe. It is early, and I am sitting in the recliner, with a cup of Mockiatto, all the lights out except the light in the manger and the Christmas tree lights. I love to reflect in the morning, alone, in the quiet and stillness, just "being" in the right now. I am sure this letter will be all over the place, as I have a hard time organizing my thought sometimes. I just like to put things down, and go with it. I am sure you all don't mind. I found this photo and I wish I had MY version of this photo. It has a little story. My dad has played Santa Claus for at least 45+ years. He is a jolly big guy and the part couldn't be more perfectly played. At our church in my hometown there is a children's mass before midnight mass. It usually has children dancing, live animals and Santa. One year, after communion, the entire congregation including those in chairs set up in the back and standing in the aisles, was quiet. reflecting, and praying. My dad, without a sound, walked into the church, walked down the center aisle, all decked out in his Santa suit, and beard that looks so real I have even seen adults tug it. He walked down to the alter, in front of the huge manger, and got down on one knee, removed his hat, and prayed. He later told me he prayed for the children and families who were sick, or broken, for peace and for all to know the love of their Savior. Without a sound, he got back up, and walked right back down the center aisle, and out the door. The looks on the children's faces were on shock, adults had tears running down their face. 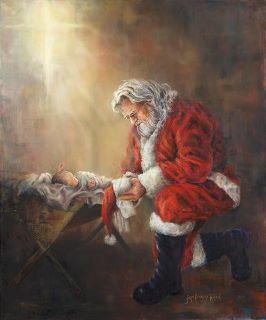 What is it about the meeting up of baby Jesus and Santa? Well, like I said I saw this photo and had to share that story with you. Somewhere floats the picture of my dad, the "real" Santa who has spent endless Christmas Eve's loading his big red bag full of gifts left in cars or garages and busted through many a front door to the "ohhhss" and "aahhhs" of children and adults alike. I have helped him deliver anything from a horse with beautiful tinsel braided into its mane and tail, to groceries to unsuspecting families going through hard times. He even got word early in his Santahood of a dying elderly woman, on Christmas eve, who only wanted a lollipop and visit from Santa before she died. Need I tell you, she got both? I could go on and on with these kinds of stories but my purpose besides sharing this photo with you, is to encourage you to never stop "doing unto others as you would want done unto you". You never know when a kind word, or gesture will be the last you give or receive, make every moment count for the good! I realize we don't all share the same religion, in fact some of you don't have a religion, or believe in what I believe. That is OK!! Regardless, I wish you all a Merry Christmas, celebrating whatever you do believe the true meaning is. CHERISH special time with your friends, your family, anyone you love. Remember it is always better to give than to receive and that means ANYTIME of year. When you see someone in need, lend them a helping hand, no matter what it is, anytime you can. Let this holy day, be one of HOPE, and PROMISE as it should be! Eat LOTS of candy, cookies, desserts..........I mean we all know it is the only time of year where gaining weight is acceptable right?!?! I started this blog for a very personal reason. Please know, your presence here, your friendship, laughing together, and going through personal life events you share with me is never taken for granted. You are all an important part of my life, and I think you for making each day full of laughter, and kindness for me and those who are also part of the Chefwannabe family. I pray you are all kept in good health, happiness and the greatest joy you have ever known in the new year. Merry Christmas!! 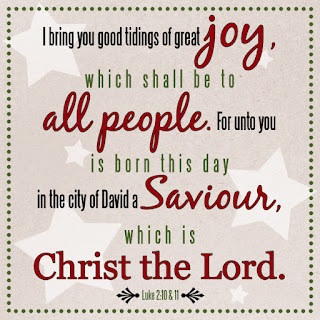 I leave you with my favorite (not religious) Christmas song......since this IS my Christmas card to you! Happy Wednesday before Christmas everyone! I trust you are all prepared for the holidays?!? I thought I had done all the baking I was going to do. However, I decided I needed to use up this Jif Chocolate Hazelnut spread I had in the cupboard. I was sorely bummed that it was terrible, (in my opinion) but wanted to find something to do with it. So using an easy Nutella Cookie recipe I have as a base, I really changed up this recipe using the Jif and a few half bags of chips, nuts, etc laying around and went for it. You could literally mix in anything you want from dried fruit to any flavors of chips, or nuts. If you follow me on Facebook, you will see the near disaster in which almost yielded my family zero cookies. My furry nephew Gus (aka Gusy Bear) sat by this plate of cookies while I took photos for nearly 15 minutes, like a statue. I started to get up and decided to take his picture as he sat so nice and bam, LICKED the cookies. Anyway he smiled so big when I told him "NO". He could be in the doggy denture commercials. I grabbed him and smooched his face and told him he wasn't in bad trouble, but it wasn't nice to "wick da tookies" (using a lisp of course) Yea, that's my dog language, what of it?!?! If you have a dog, you have a language, and don't pretend you don't. Anyway, we are about 2 hours away from the start of a big snow storm. I can't wait to post you all some photos later! SNOW ANGELS! Wait, BLOODY MARY'S and then SNOW ANGELS. You think I won't, do ya? HA! This is one of the easiest recipes you will find. Preheat your oven to 350 degrees. Combine all ingredients. Line cookie sheets with silpat or parchment paper. Roll into approximately 1 inch balls. Using the palm of your hand flatten them out a bit. They will hardly spread so no worries about that. Bake 8 min, or until set. I did 8 and they are perfect, still soft and SO chewy! I am afraid 9 will make them cool and be hard. If you like hard, crunchy cookies, 9 it is my friends! This made about 4 dozen cookies! These are almost like a cross between a chewy brownie and a cookies. My gosh, they are SO good! Hurry, get this one made up! It is quick, easy and CHOOOCOOLATTEEEE. I sang that, in an opera voice. Only a WEEK until Christmas you guys! Accckk! Is your shopping done? Cleaning? Decorating? Baking? Hurry, hurry, hurry! Actually what I wish you would all do is sit down, make a Mockiatto, and think about the real reason for celebration. Daydream for 20 minutes about holidays past, memorable gifts, memorable visits and realize, the house being clean isn't important, the only thing important is the special time you will spend with those you love, family, friends, etc. I was just thinking about the Christmas I got my first pair of Velcro sneakers, and pin stripped jeans. Or the Christmas I got a red plastic sled FILLED with new crayons and coloring books. How about my first cabbage patch kid?! So many fun memories. Nobody will starve and the Christmas tree may not be perfect, the garland may be half falling off the window but is all that REALLY so important? 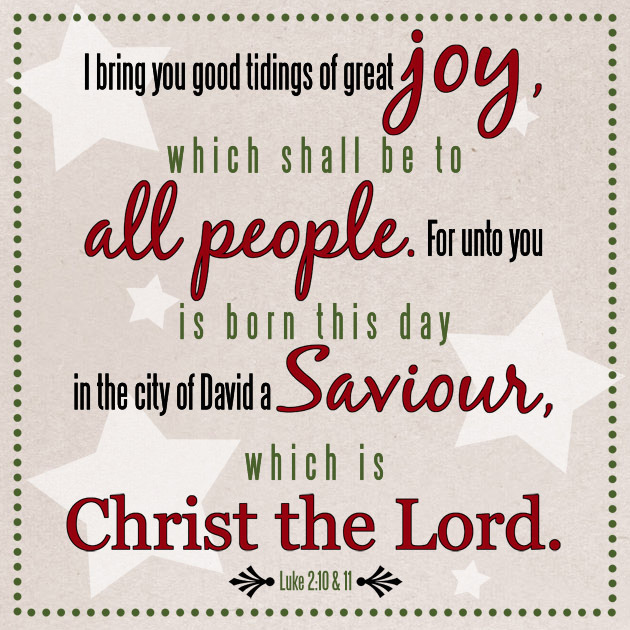 Celebrating the birth of our savior, IS the reason for the season!! OK, turning off memory lane now. You all know what an avid coffee drink I am. I think I could possibly qualify for a career in competitive coffee drinking. I drink way to much coffee, my doctor says so anyway, I say, can you EVER drink ENOUGH? I love the flavored creamers, I love it black, I love it about any way I can get it. Instead of spending to much money on expensive coffee drinks from fancy coffee houses, I would love for you to give my Mockiatto a try. I found a recipe similar at Hillbilly Housewife and wanted to change it up to the flavors I enjoy most....caramel and vanilla. Add all ingredients to your food processor. Process until it is a fine powder. Add 3 heaping tbsps to 10-12 ounces of hot water. You can adjust to your taste, more or less! This keeps beautifully in an airtight container. How about giving some for a gift?! 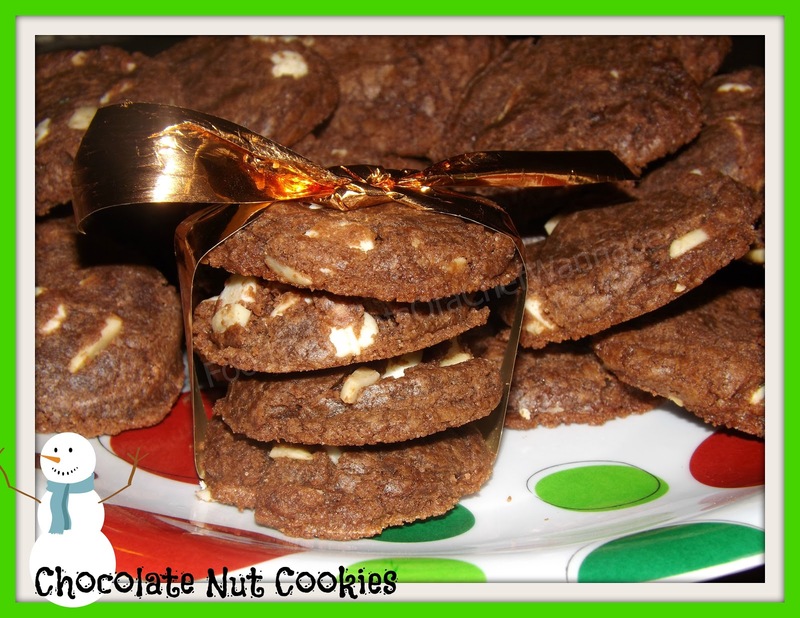 Include a baggie of it on your cookie tray! You do NOT have to do this in a food processor. I just like it powdery more than I like it in bigger granules but will work fine either way! Enjoy my friends. 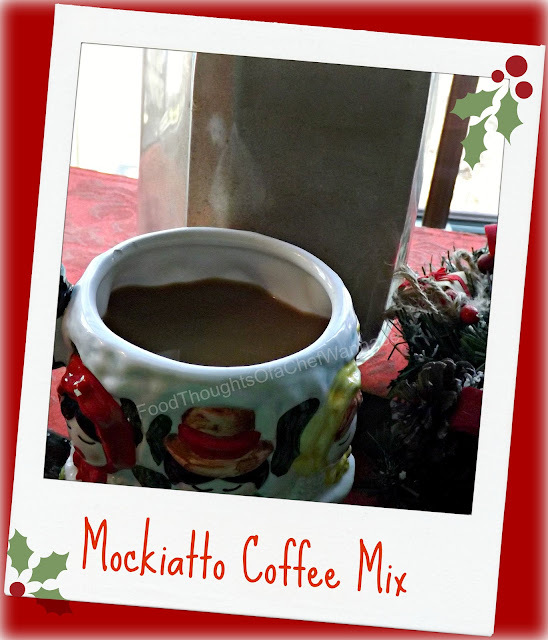 Take a minute to cherish the true meaning of the season and enjoy the preparation and anticipation with a hot Mockiatto! Deep Thoughts....... Hold on, this is SO random. Time to put your tongs down. Shut off the kitchen light, grab a cup a' joe and come sit down. Sometimes, no matter how much I love food, cooking it, sharing it, writing about it, there sometimes comes moments when you realize it is time to set ourselves back on a good path. Does this mean I am on a bad path? Absolutely not, but in the last 5 years, my opinions, my values, my morals, and the way I choose to try very hard to live has changed. alot. These are just some things that have been on my mind since Friday. Well for awhile, just that I finally decided to put them down after Friday. It is a shame that it takes a horrible tragedy to shake us up. I don't share alot of my serious personal opinions, or beliefs, because that isn't what my page is about. But I wanted to just give you a glimpse into the the woman I am, some of my random thoughts on random subjects. I hope in the end we still respect each other for our differences and still laugh and enjoy cooking together. I have been through and am going through alot in my life, and I think because of this, I have grown spiritually and emotionally. I don't always make the best decisions, but luckily, I haven't made any to horrible yet. I never discuss politics. I don't know much about them to be honest, and sadly, I don't care much about them, until of course, it affects me or my family. I need to change that and become more educated. It is on my life "to do" list. I have seen friends and families split over which party runs this country, and it sickens me. I mean, really? I disagree with the war we are still fighting, because my son is a soldier. Do I know all of the reasons we are there? No. Do I know that when my son calls to tell us he is deploying, I keep it completely together while I get the details and then fall to my knees in prayer, begging God to keep him safe, to keep him wrapped in his armor and not to let him be taken from me? You bet I do. Do I kiss my husband goodbye every single morning and tell him I love him? Yes, I do, because you never know the last time you will see those you love, just ask the families of those lost in Connecticut. The people in my life, have become so much more important than any THING in my life. Maybe at the ripe old age of 37, I finally get "it". When will people learn their lives aren't measured by how much money or how many THINGS they have? SO many people still don't get "it". I was born and raised Catholic. I was away from the church for 10 years. In the last 5 years, I have gone back to church, but it is not a traditional Catholic church. It is Catholic...but it is unlike any Catholic church you have been to. Trust me. It is Catholic gone wild! Do I completely roll with the Catholic doctrine, no, I do not. But my soul, and my faith are fed in this church. I find what I "need", there. So many people say they don't go to church because they don't believe in organized religion. What's your point? I look forward each week to going to the place where like minded people are, to worship together. You know that whole, "where 2 or more are gathered in my name" thing? Today, our priest delivered an amazing message. It was a message asking us to find something we love, something we think we can't live without..and give it to someone who needs it MORE. Be it something material, or something bigger, like forgiveness, Just be nice to people. Why does it have to be more complicated than that? Be nice. I don't care what your religion is, and I don't even care if you don't have one, be nice. Be respectful. Be a good person. I am a grudge holder by nature, and I am trying so hard to stop. I try hard to be a good person, I sometimes fail miserably but, my heart is good, my intentions are good, I just fall sometimes. As a former teacher, and a parent, and perhaps with all of things I am going through in my life, I find it hard to believe just as a human, I was not the only one to sit in front of the TV, sobbing. Yes, I sobbed. I cried for those parents, I cried for the children who never really got to live, I cried for the teachers, who feel like they should have been able to do something. Nobody could do anything more, our heads tell us that, but in their hearts they will feel like there was more to be done to keep these babies and teachers/administration safe. The first responders will wonder, if they had been quicker, could they have saved those victims. It is human nature to feel you have inadequately done something in a terrible situation as this. Instead, I feel like it is so important, to get the bigger picture, to get "it". And for the record, I still am having these little crying spurts. Why does something like this have to happen to remind us to hug our kids tighter? Spend more time with them? To cherish the GIFTS they are to us? WHEN did we become so out of touch with the importance of human life? The GIFT of human life? When did "killing things" become cool. Video games? Television? I don't know. I do know, that even though I think I am very in touch with the value of a life, if I hear of a shooting on the news, which I rarely watch, it doesn't really phase me. Like it is, oh, just another shooting. It was LIFE, taken away. When did that stop being shocking and horrible? Stop being that person who thinks bad things only happen to other people and start learning to get "it". Can I also ask a question? Why in the HELL are these parents allowing their children to continually be interviews by reporters? WHY would you further traumatize them by having them asked completely out of line questions by reporters who need slapped, over and over again? Are you KIDDING me? And why do we have to have psychiatrists telling people to not let their kids watch the news coverage on TV. Why should a 6 year old in Texas be worried about going to school, unless they were exposed to all the coverage. WHY do parents continue to insist on subjecting their kids by television or discussion of ADULT matters? Anyway, this, completely out of my realm blog, was of course sparked by Fridays events. I do not apologize. I am who I am, my feelings are mine, my opinions and questions are valid....to me. I live in a world of mutual respect, not only those who are liked minded but respect for those who have different opinions. I realize this is like a the ramblings of a crazy woman, but I had so much to say, I just put it down.....unsorted and raw. I hope this finds you all in the midst of the holiday hustle and bustle. I adore all the preparation for this holiday! The cooking and baking and shopping and wrapping..."these are a few of my favoriiiiite tthinnnnggsss". But where is the SNOW? No snow here in NE yet, but I have my fingers crossed we will have a white Christmas! Have you been watching all of the Christmas movies? Comment below, tell me your favorite one. I have so many, I think I professed that one particular one was my favorite but the truth is, I love the Grinch. I LOVE the Grinch. The newer one, and I dream of being none of then her highness, Martha May Whovier! The woman with the most, who loves the out casted, ugliest, green, most unChristmas loving Whoville citizen.....the Grinch! What a love story! Anyway, I don't know about you, but when I was little, we watched these movies with hot cocoa and popcorn. I can still remember the "popcorn" bowl. A big metal bowl, silver, with this odd handle thing. I wonder what ever happened to that old bowl. Is it normal that kitchen items were what I remember most? Anyway we would top them with marshmallows, as many as we could sneak. I carried this same tradition on with Cody. The 3 of us huddles on the sofa, covered in one big blanket, sipping hot cocoa and eating popcorn. I love traditions! 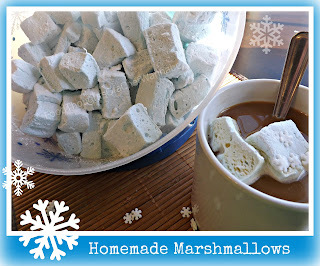 If I knew what I know now, we would have been sipping hot cocoa with HOMEMADE marshmallows. I am never looking back guys. 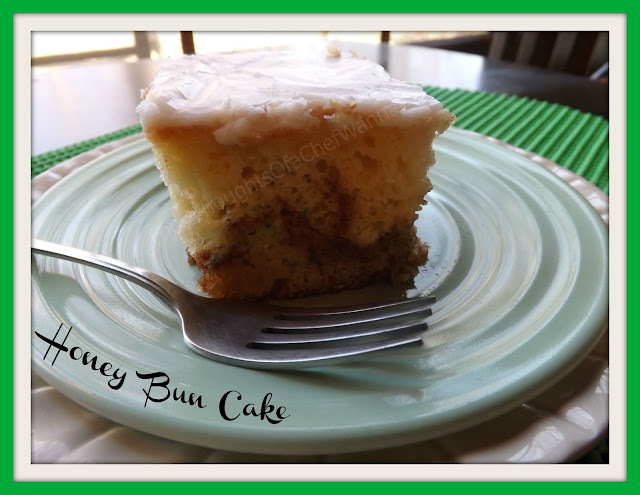 This is SO easy and they are SO good, it is a little bit of heaven. They don't melt and dissolve into your cocoa, they melt, and lay on top like a sweet layer of melted snowman, you simply MUST try these! (note, I tinted my ever so slightly blue. Because I wanted to...THAT is why) This is not my own recipe, this is a recipe from joyofbaking.com. I guarantee you all of these marshmallow recipes are darn near the same but this one turned out so well, I say go with it my friends! Ok, so prep work is key here. I used a small 9x13 pan. So I guess it is more like maybe 6 or 7x11. 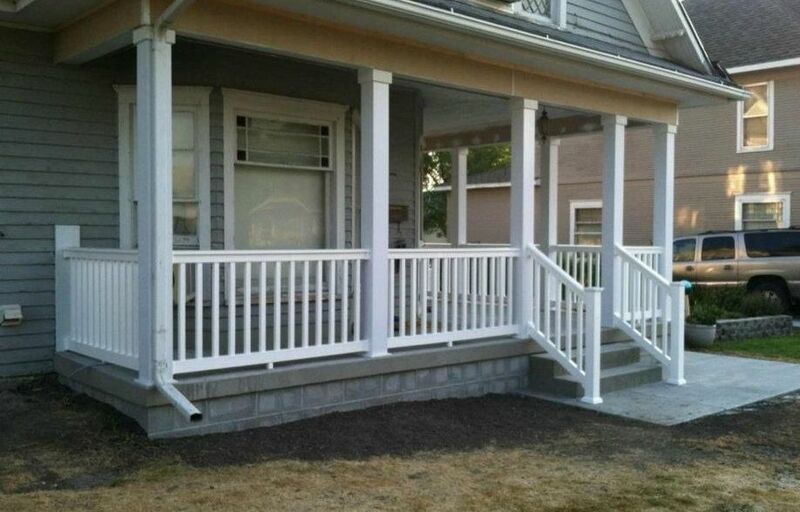 You can use a 9x9 square as well. You want to spray WELL with nonstick cooking spray and then dust with powdered sugar much like you would flour a pan. I did this, then I lined it the long way only with parchment paper. I forgot to spray the parchment paper, but you won't forget so do that now. Spray it and re dust a little, but I would still do it on the bottom of the pan as well. Now set aside. If you have a stand mixer, use the bowl to put in all 3 packets of gelatin and 1/2 cup of cold water poured over the top. DO NOT MIX. Otherwise do it in a heat safe bowl you will be using your hand mixer with. Set aside. In a medium-large saucepan combine, sugar, remaining 1/4 cup water, and corn syrup. You will need a thermometer, candy or meat to gauge your temperature. Mix ingredients and bring to a boil. Now, realize that this is OH MY GOSH, HOT! Keep it in mind. When the temperature gets to 240 degrees F, carefully pour over your gelatin mixture. If you do not have a thermometer, one recipe says bring to a boil and then let boil for 1 minute. It took mine 2 minutes after boiling to get to 240 degrees. So go with the 2 minutes to be safe. Now, put your bowl onto your mixer with a whisk attachment or get out your handy dandy hand mixer and go to town. You are going to mix until the mixture is fluffy, stiff and has tripled in volume, this will take about 10 minutes. When it is done, add in salt, vanilla and any food coloring if you choose. Mix until combined and then pour into prepared dish. Use a knife or off set spatula to to smooth, dip it into very hot water first and then smooth. Now, let this sit, at least 8 hours but overnight is better. When you pull it out of the pan, put unto a cutting board and use a pizza cutter, kitchen shears or a knife, dusted in powdered sugar to cut. You can also use cookie cutters for shapes. When you cut them, toss them into some powdered sugar to coat or they will be sticky. Store in a container with a lid. I have no idea how long they will keep because mine aren't gonna last that long! Enjoy these my friends, they are SO good and you could even change out the flavor!! Mini Mate- GIVEAWAY!-(closed) WINNERS ARE..
You have 48 hrs to email me your address so I can forward them to Mini Mate where they will ship directly to you!!! CONGRATULATIONS! I have a giveaway for you.....one that is good for your health and especially at the holidays when refrigerators are opened and closed constantly, never allowing the temperature inside to stay cool enough to keep all food safe! This product will fit into every moms life, it not only saves money but kills ecoli, and bacteria that grows on food inside of the fridge. I could go on and on but instead, I am going to give you a solution! The folks at Mini Mate would like to giveaway 5 of these to my readers, and help ensure YOU and your loved ones stay healthy with the holidays quickly approaching. Remember, that we never know about recalls on any foods until a few hundred are sick or have died. Why wait for this to happen?? We can take a major step in helping prevent this by having our own defense. Here is how the Mini Mate works. 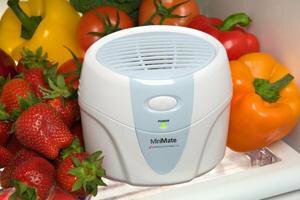 The Mini Mate uses activated oxygen technology to help safely extend the life of fresh produce by oxidizing the bacteria and mold growing on the produce and food, as well as oxidizing chemicals and pesticides. Now let me give you the details on how to win one of these! This giveaway is only open to US residents 18 and over ONLY. Upon your name being announced as the winner on here and my Facebook, you will have 48 hrs to email me with your mailing information. I will turn that information over to Mini Mate and they will ship directly to you. Also, I have good news for anyone wanting to order their own Mini Mate, in the event you do not win one.. Reference "ChefWannabe" in your order and you will receive free shipping and a free holiday CD! I have made spaetzle a couple of times. I love it, my husband loves it, and so it goes. 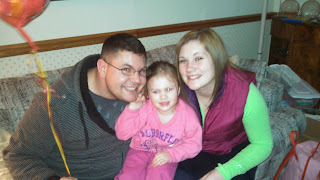 I was recently introduced to a friend of my kids', Viktoria Bridges, who is married to a US soldier and lives in GA now. She hails from Bavaria, Germany. We just had a conversation about spaetzle 15 minutes ago. Oh the things I THOUGHT I knew! I served these with butter and parsley. My husband prefers them fried before serving. Viktoria does too! She also told me that you can add nutmeg. You can fry them up with onions, and then cover them in gouda cheese and put them in the oven. She even told me she adds mushrooms! Best I can tell is that you can do just about anything with spaetzle that you could do with American egg noodles. In fact, I even added them to chicken soup instead of noodles once. So allow me to give you the basic recipe and serving method. What you do from there is limited only by your own imagination! I served a side of gravy as well to top them off with! In a bowl whisk together the eggs, water, salt and white pepper. Use a spatula and mix in flour, mixing until the dough is combined. It should be sticky, not runny, or to stiff. Just a sticky dough. Set the dough aside. In a large (ish) pot, bring 6 cups of water OR chicken stock to a boil. If you choose to use plain water, make sure to salt it well. Using the spaetzle maker, load dough into the holder and begin moving the maker back and forth. You can also use a colander and using a spatula, push the dough through the holes of the colander. If you have a grater that will work use that instead of a colander. You may have to load them up more than once but continue until you have used all of your dough. When the spaetzle rise to the top, they are done! It is that fast and that easy! Drain them and put into a serving dish, add butter and parsely and toss. You are ready! Try this, you KNOW it is time to change up the same old humdrum sides and have spaetzle! You will be so glad you did! You can thank me later. As you all know, I love YouTube. It is an unhealthy, amazing addiction. I like watching lots of YouTubers but obviously cooking ones (ok and makeup) are my obsessions. I ran across this crazy chick, who is dubbed "The Crumb Boss" (Gretchen). She owns a bakery in North Jersey and she and her best friend, Steph (the producer) are hilarious, and inappropriate and completely addicting to watch. (at least to me and almost 32,000 other viewers they are!). Anyway, recently I ran across this adorable little Christmas treat. I had seen it on Pinterest, but the reality is, the Crumb Boss is much cooler and it gave me a chance to share these Jersey girls with you all! She even had a cute name for them and upon emailing her, she gave me her blessing to share it with you all! However, I did NOT cheat and fill half my bowl with plain bugles........*insert throat clearing gag noises*. Anyway, I know so many of you are very busy and though you enjoy Christmas treats it is tough to find time for tons of baking. These treats, you just assemble and they are the perfect combination of salty and sweet. HOWEVER, I have a few "lessons" to pass on to you guys. The original Elf Hats called for regular M&M's. I thought I would be smarter than Gretchen, and would use peanut M&M's. Yea, not so smart. They are a little big, they still give the effect and look cute, but, when I make them for Christmas trays, I will use plain. See what happens when you are physically and emotionally unable to stick a recipe? Also, unless you were born with 4 arms, who can work as separate units, get a buddy to do either the filling or the candies. My chocolate got everywhere when I put the bag down to put the M&M in. Just find a buddy, someone to share a glass of wine and make Elf Hats with. Shouldn't be to hard. I don't remember how many this made, but I can tell you that it made quite a few, plus the 6 or so I ate while putting them together. I would suggest melting just half of your chocolate at a time. Just a note I don't want to forget to tell you. Get a cookie sheet and line it with parchment paper or foil, Melt your chocolate, half of the bag at a time in 30 second increments until all melted. Pour into your disposable pastry bag and cut off only the very tip! 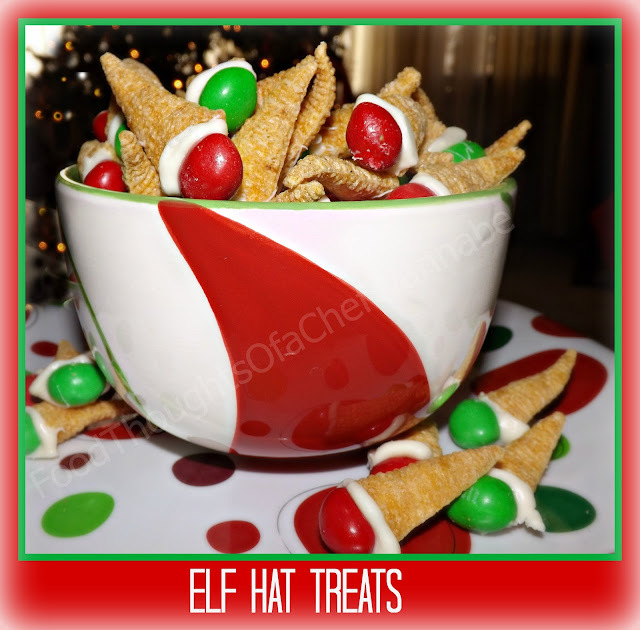 Fill each bugle with white chocolate, let it overfill a tiny bit and stick your M&M in for the elf head, into the "hat". Rinse and repeat. Go until you run out of ingredients, or you just get tired of making them. Make sure to eat the ones that don't look just right, and work fast, before your chocolate hardens in your bag! Thanks to Gretchen for graciously letting me share her little snack, and for the constant entertainment and great recipes I get from her video's! I will link you to her channel, and FB page below! Yes I did say, "loaded". How else are you supposed to eat a potato? I have been getting sick of the same old hum drum potatoes. Baked, mashed, scalloped, Au gratin, hash browns, yadda yadda yadda. I realized in a moment of desperation, that I have never made a single, solitary twice baked potato. Is that odd? I feel like it is. Anyway, I rectified the situation, and actually had another "first" in my life. A potato EXPLODED in the oven. Whaatt??? Only one out of the 3 I had in there exploded. What a mess. I roasted my potatoes in the oven. You can do yours in the microwave if you like. It makes no difference, just do not under cook them, and don't overcook them. K? I used medium size baking potatoes, but would rather have had larger potatoes. Remember you get 2 servings from one potato, ALTHOUGH...I foresee making these again and making extra and freezing them. Why not?! Preheat your oven to 350. Cut your already baked potatoes in half and carefully scoop out the insides into a bowl. When all potatoes have been scooped out, mash the potatoes with a masher or hand mixer until broken down to your liking. Add in 1/2 cup shredded cheddar cheese, sour cream, bacon, green onions and milk. Using a spoon combine until all mixed. Add salt and pepper at this time, to taste. Carefully refill each potato boat equally. 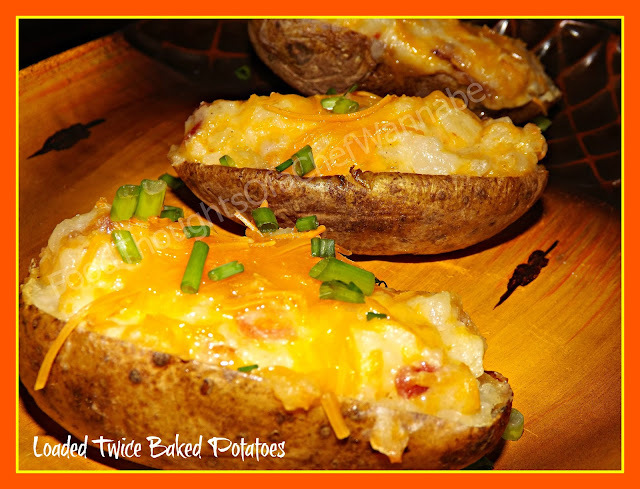 Use remaining 1/4 cup shredded cheddar cheese to top each refilled potato. Bake 20-25 minutes or until cheese is melted and the whole thing is heated through. Top with green onions if you like. Note: If you bake and refill the potatoes ahead of time, they will take a bit longer since they are starting from a chilled state. I hope you enjoy these as much as we did. They make a great side dish to almost any meal! Happy week after Thanksgiving! Let the shopping begin!! Right? Most importantly, let the BAKING begin! Why is it, that I find my best recipes are born from the marriage of random leftovers? I think it is because I refuse to through leftovers away and I am forced to be creative. I have had these blasted hazelnuts in the freezer for like, oh I dunno, a LONG time I have needed to use up. I had never made brown butter, or sweetened brown butter but of course eaten it so I wanted to try it. My husband is sitting here and we are laughing over all the things people MIGHT make out of leftover pumpkin. So he just said, " With my leftover pumpkin, I made a reduced fat, pumpkin vichyssoise served with gluten free, whole wheat and non fat, pumpernickel bread croutons. I topped it with a dollop of non fat, gluten free creme fraiche substitute made from the purist tofu". Ok so, before you get offended, we are joking, he just had to incorporate all of his own personal worst nightmares! If you could hear how hard he is laughing. I don't know, I think it is a turkey overdose. Also, see how all the drizzle is pooled on the sides of the bread? A good photographer would have picked the bread up after it was set, and put it on a clean plate. Me? HECK NO! That pooled drizzle is the part you use a butter knife to pick up and spread more on your piece of bread! Shhh, I won't tell if you won't tell! Preheat your oven to 350 degrees. In a bowl combine flour, sugar, salt and baking soda. Mix completely and set aside. In a separate bowl combine the pumpkin, eggs, oil, water, cinnamon, vanilla and nutmeg. Mix until they are combined. Now, pour the wet mixture, into the dry mixture and using a spoon, mix until just combined. At this point you can add in your toasted nuts as well. Get them totally mixed in. 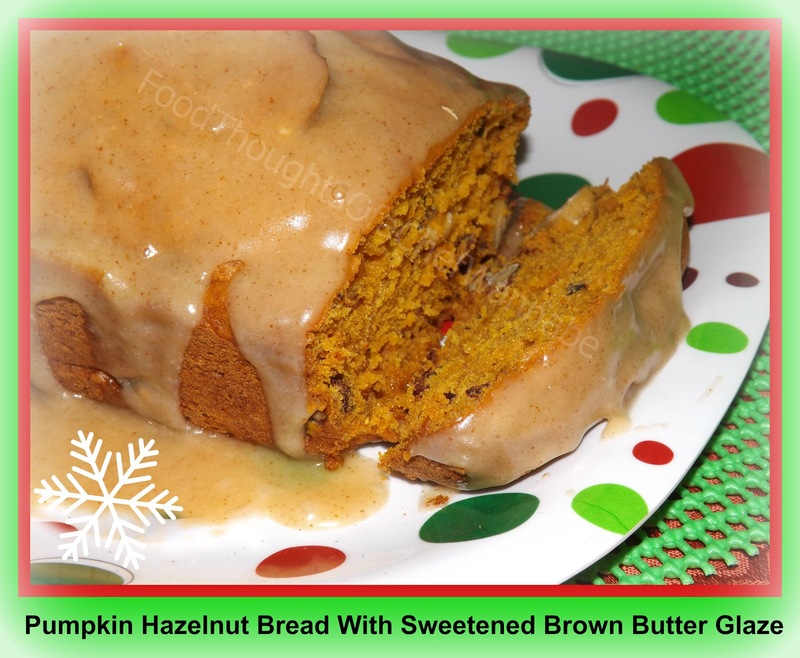 Prepare your standard loaf pan with nonstick cooking spray or butter. I line mine with parchment paper just down the center and leave it long enough that when it is done, I can use the parchment as handles to lift the loaf right out! (see photo below) Just LOOK at the color! Bake for 50-55 minutes. When a toothpick or skewer comes out of the center clean, you know it is done. Cool COMPLETELY before icing!! In a small saucepan, add in your butter. Let it go on a medium heat until it turns brown. Don't walk away, just watch and right when it turns brown, it will be done. Remove it from the heat and add in powdered sugar. Add milk as needed until it is the consistency you want. To be honest if you want it thick to spread on the top that is fine, or if you want it to drizzle add the milk until it is where you want it. Drizzle over the bread and let sit for 5 minutes. Serve!! You could make mini loaves and put them on your cookie trays for Christmas. Freeze them even! I will tell you all about how I feel about cookie trays soon...........or did I already? Great name, isn't it? Thanks honey! My husband came up with this, during our discussion on what to name it. I love it! And it is exactly what it is! I labeled the photo as CHICKEN but, that is because I used chicken, you will see you can choose any protein you wish! I LOVE lo mein. I was out of the usual pasta I use for lo mein. I use soba noodles or pancit canton noodles. I realize not everyone has access to specialty pastas and since we didn't feel like running to the Asian Market, I used spaghetti. I also am trying to reduce my sodium. When I spent a couple of days really paying attention to the amount of sodium in my food I almost died. I wanted to cut down on the amount of sodium, I mean using soy sauce, you can't cut it all out, but all of my products are low sodium. You all know I am a carb fein, it is impossible for me to say no to pasta. You can keep trying to convince me all you want about wheat pasta, but I tried it. I don't buy your "you get used to the flavor". Nope, I have made enough changes in our diets, to NOT have to choke down whole wheat pasta. I made like 12 typos in that last sentence just trying to get my fingers to TYPE "whole wheat pasta". The point is, that is not going to change for me. This isn't of course all of your usual lo mein suspects but it is what I had on hand and what I love is that you can add any veggies you like or need to use up. Same with the protein, use pork or beef or no meat! This is just a method you can use, when you need a quick, VERY budget friendly meal. I also added some heat to mine, but as always, that is easily omitted. 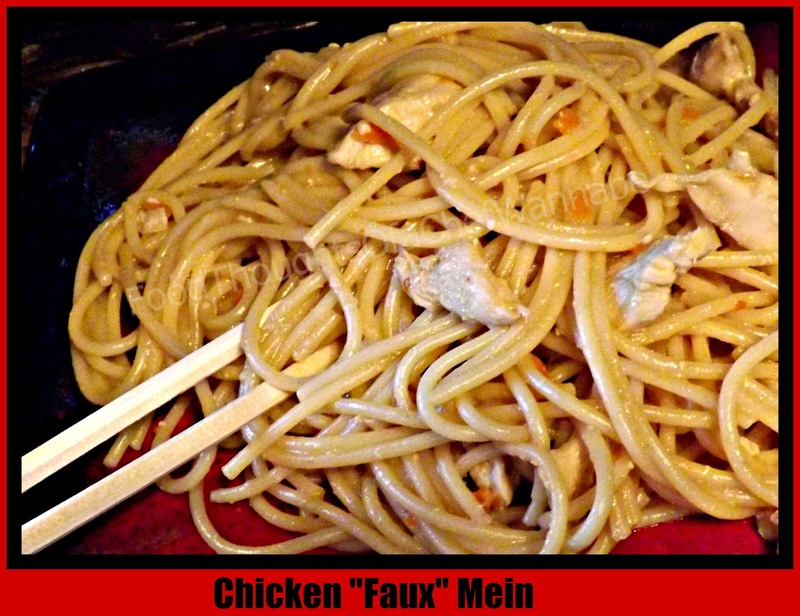 Here we go for this easy, budget friendly, tummy satisfying, faux mein! 2-3 chicken breasts, thighs, pork, beef, or tofu. 2 cups veggies of your choice. Divided or all the same, no matter. Cut your meat into think slices and then strips. You want them to cook quickly while you stir fry them. When you have them cut, place them in a bowl, add 2 tbsp soy sauce, ginger, red pepper flakes and garlic. Mix together and let sit at least 15 minutes. In the meantime boil your spaghetti. Drain it and then rinse immediately with cold water for this recipe. Let is sit in the colander and just drain and dry while you prepare the rest of your ingredients. In that same pot you boiled your pasta in or a large wok, add in 2 tbsp peanut or vegetable oil . In a large wok or same pot you boiled your pasta in, add in 2 tbsp peanut oil. Add in your meat and stir fry until it is cooked completely through. Add in veggies of your choice and cook another 2 minutes. Now add in your chicken stock. Let simmer a couple of minutes to slightly reduce. Add your pasta and toss, also add in 2 more tbsp soy sauce and unagi sauce. When all the pasta is covered in the "sauce" it is ready to serve! I LOVED this, I would loved it more with green onions and bok choy but, next time. There is no heavy "sauce", it just is really good and light. I enjoy writing you recipes that you can change up to meet your families tastes and dietary needs. My husband was dying for mushrooms in it. My goal is to add more lean protein and veggies than pasta. I am not there yet, because I was low on veg, but that is my ultimate goal with this recipe. I say to add 2 cups of veggies as an option but the reality is, add all the veggies you want! Easy, quick and really stretches the buck. Try my FAUX MEIN soon! It is no secret, I love all things caramel. Even more than I love all things chocolate. It is what it is. I realize it is unwomanly (is that a word?) to not go gaga over chocolate but, I go gaga for caramel. I especially love it on cheesecake. I asked you all on Facebook how you felt about cheesecake and what you liked to top it with. There are so many options aren't there?! Many of you like cherry pie filling, strawberries, caramel/turtle varieties and my husband and dads favorite, pineapple. I am usually a purist, I like it plain. I actually like it from Aramingo Diner in North Philly but we all know, I can't just hop in the car and go for a cheesecake run with my bestie anymore. (insert sad face). It just occurred to me, that they used to SHIP. Any of my Philadelphia peeps, do you know if they still do? Anyway, I have a recipe for Sopapilla Cheesecake here but this is just a little different. And it is a "mini", you all know how I feel about that. Now, for this recipe, I used my caramelized sweetened condensed milk technique. I know there are many ways to do it, but I boil mine, it is what I have always done so that is the one I am recommending. Place your sweetened condensed milk (still in the unopened can) in a large pot of simmering water. NEVER let the water get lower than the can, it MUST stay covered with water. I cover with a lid and let simmer 3 hours. I check a few times to see if it needs water but as long as you keep it covered it should be fine. Now shall we get to the makin' part? I think so too. This recipe will make 12 mini cheesecakes! 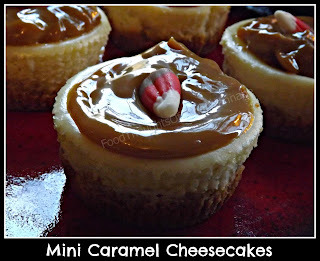 I used Caramel Apple Candy Corn for the tops, use whatever you like! 1 1/2 cups graham cracker crumbs. Mix together in a small bowl. Line your muffin tin with papers and divide crumbs among them. It comes to about 1 1/2 tbsp per cup. Give or take, just work it out, I have faith in you! Use a clean finger to press them down. You like how I say that? Like you might pick your nose just before hand or something. I combine all of these in my food processor and saved myself the overworking of my fragile arms. HA! Use a hand mixer, stand mixer, food processor, or your arms to combine this until smooth and creamy! Divide among the 12 cups. They will be close to the top, but no worries on that, just git-r-done. Did I just say that? Bleh! Bake for 30 minutes. You can check at about 25, but I am nearly positive our ovens aren't THAT different, they were perfect at 30 minutes for me. They will have puffed up a bit. But as you let them cool, they will fall a bit. If a few are cracked, no biggie, we are going to cover it up anyway! Let them cool for 20 minutes. Now you have to decide what you want to do. If you are going to transport them keep them in the pan. 12 pieces of your favorite little sweet treat for the top! Top them with the caramelized condensed milk and then a colorful treat OR take the wrappers off, top them and plate them. Either way, they need refrigerated for at least 1 hour before serving, they are just best that way so don't try and talk yourself out of it. I took them out of the papers because I liked being able to see the layers but feel free to leave them on too! I hope you decide to put these on your holiday table, or your everyday table for that matter! Be careful, you might not be able to stop at just one! PS. Unwomanly in fact, is NOT a word.